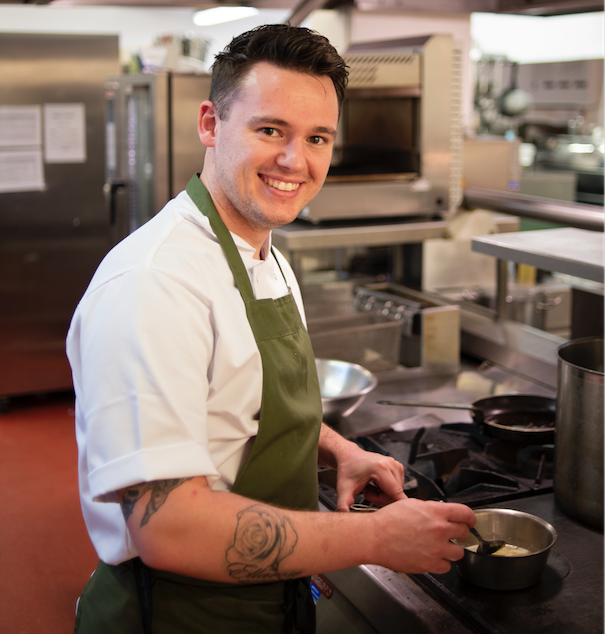 Adam Harper, head chef at The Cavendish Hotel, Baslow has reached the finals of the prestigious Roux Scholarship 2019. A massive 800 applicants were eventually reduced to eighteen chefs contesting at the semi finals to be one of the six to go through to the final round. Two semi finals were held, in Birmingham and in London, when the chefs were asked to create their own dish using hogget, meat from a young sheep Adam describes as “a teenager that’s full of flavour”. This was followed by a dessert using ingredients from a mystery box provided on the day of the competition; Adam created an apple and ginger crumble with a golden syrup custard. He commented: “It was important to do something simple but really well to demonstrate my technical skills and to allow the flavours to shine”. Adam is one of only two finalists to come through from the regions, one other from Jersey and the remaining four finalists are from top London restaurants including two from The Ritz. Michel Roux (junior) said about the competition: “Amazing standard. Every year it just gets better and better.” The final will be held over a full day in London on 1st April. The Cavendish Hotel is part of the Devonshire Hotels & Restaurants Group, a collection of luxury hotels, restaurants and inns, located on the Duke of Devonshire’s estates at Chatsworth in Derbyshire and Bolton Abbey in Yorkshire; owned and operated by the Chatsworth Trust. Formerly an 18th century coaching inn The Cavendish offers stylish comfort with 28 bedrooms. There are two restaurants – the fine dining Gallery restaurant and the open-all-day Garden Room, plus a chef’s table in the kitchen and a private dining room.